With her state-of-the-art Extreme Semi-SWATH (XSS) hullform, Oxygen redefines the explorer yacht genre, offering outstanding speed and seakeeping performance with the luxury and facilities of a true superyacht. 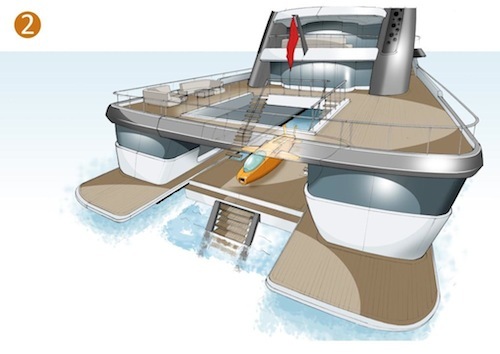 Equipped for all manner of pursuits, Oxygen’s primary role is a dive-explorer yacht carrying not only extensive diving equipment but also her own submarine, launched from an innovative stern lift that doubles as an adjustable swim platform. 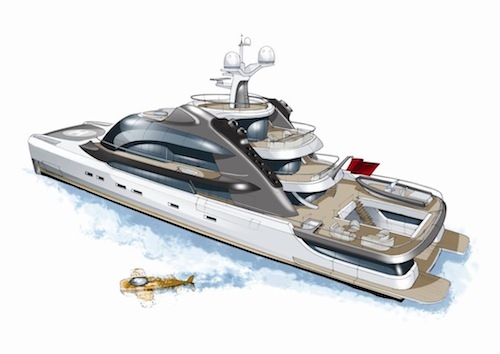 Measuring 55 metres in length, and powered by four MTU 2000 series diesel engines driving a pair of controllable pitch propellers, the yacht can comfortably reach speeds of up to 24 knots. While her low draught allows access to shallow, inshore locations, a ride control system consisting of active T-foils and interceptors ensures a smooth ride even in the most demanding offshore sea conditions. Oxygen’s exterior has been designed with a fully glazed appearance, promising masses of internal light and spectacular views out. The flush-sided, single volume deckhouse stands apart from conventional stepped and tiered superstructures. Internally, guest accommodation is spread over three decks with the Owner enjoying forward views on the main deck with a private terrace. Aft on the main deck, Dive HQ provides changing facilities for the day’s underwater activities and permits direct access to the water once the stern lift is deployed. The main saloon and dining room are situated on the bridge deck above, along with the VIP cabin, Captain’s cabin and senior crew accommodation. The remaining crew cabins are located on the lower decks. Aft, a large dive store with decompression chamber and service area are located in the port side lazarette with the crew tender to starboard. Above deck, an eight metre tender and five metre submarine rest whilst the fore deck helipad adds further exploration options for guests. Every bit of the design is very next generation and worth keeping an eye out for.